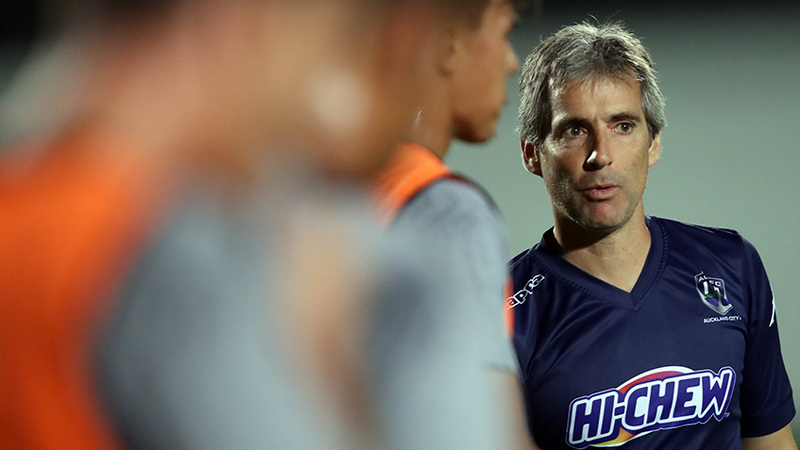 AL AIN, UAE - Auckland City FC coach Ramon Tribulietx is backing his Navy Blues side as they look to outdo their own history-making exploits at the FIFA Club World Cup in Al Ain when they face Al Jazira on Thursday morning (NZT). In 2009, Auckland City FC beat then local representatives Al Ahli in the corresponding Club World Cup match thanks to goals from Adam Dickinson and Chad Coombes but in those intervening years club football has lifted off in the UAE with a seemingly endless stream of money flowing into their domestic game. Tribulietx knows Al Jazira will be a step up from Al Ahli, and while keen to manage the expectations of a footballing public increasingly use to Navy Blues teams causing upsets on the world stage, he is confident his side will get themselves up for the playoff despite the riches available to his opponents. "When you look on paper at what we are as a team then this game is a big step up for us. But we're getting better and we have experience of playing games like this but the reality remains the reality - we don't have anywhere near the same financial resources as our opponents do," Tribulietx said. "But we'll approach this game with humility as we always do because we want to do better than we have done in the past. Last year we lost in the last minute to Kashima Antlers who took Real Madrid into extra time so that says something about how well we prepare for this competition. "We understand Al Jazira is a very good rival with a very talented team. We've seen a lot of talent in their front line and know the size of the challenge set before us." As the only amateur side in the seven team competition, Auckland City FC head into Thursday’s match as big underdogs but Tribulietx talked down the prospect of his team suffering from stage fright at the dazzling $1.2B USD Hazza Bin Zayed Stadium on Thursday morning NZST. "We're always playing big international tournaments away from home so we're used to impressive stadiums with big atmospheres. We played Raja Casablanca in 2013 in front of a crowd that was very hostile towards us and we competed very well. "We did the same against Moghreb Tetouan in 2014 during a penalty shoot-out and it was the same. Being here doesn't change too much for us and we know how to focus on our football. Maybe it will take ten minutes to settle the nerves but our focus will be on our football," he said. Al Jazira boasts a number of top quality internationals but one of its biggest stars, attacker Sardor Rashidov, could be a menace having played against the Navy Blues for Uzbekistan back in 2014. World Cup-bound 33-year-old wide midfielder Mbark Boussoufa of Morocco is another potential threat although former Real Madrid and France midfielder Lassana Diarra is missing from the squad. Tribulietx praised the standard of the UAE league and football in the Asian region as a whole but added the Navy Blues would be no pushovers. "We have a lot of respect for Arabic football and we respect Al Jazira as a team. We have played three times against teams from this part of the world in the past and so we understand the style of football we're up against. They've got players with a lot of talent but we also understand what we have to do with the ball to hurt them in the certain areas. "Al Jazira are used to playing these types of games in their league. Our domestic league perhaps isn't at the same level as Al Jazira's but we've competed in other international tournaments (Nike Lunar New Year Cup) and beat teams like FC Seoul (1-0) so we are getting more confident in what we are doing regardless of the calibre of opponent in front of us," he said. Midfielder Mario Bilen put in a full training session last night but remains doubtful for selection, while replacement goalkeeper Cameron Brown is over his jetlag having raced to join the squad as a last minute replacement for Danyon Drake who dislocated his shoulder at training earlier in the week. Bilen's injury will be closely monitored by Auckland City FC medical staff but he could be available should the Oceania champions advance in the competition which would pose a healthy selection dilemma for Tribulietx who has plenty to choose from in midfield with Albert Riera, Te Atawhai Hudson-Wihongi, Cam Howieson, Reid Drake and Fabrizio Tavano all capable of starting the match. "We want to do well but we as a club but we understand the level of football we are coming from so we take the FIFA Club World Cup as a big plus for us. The fact we have taken some big teams to the limit in the past says a lot about how we prepare for this competition. In a one-off game we can compete and if you look at the way we prepare and have played in the past it is something we are very proud of and want to continue," he said. Auckland City FC's match with Al Jazira will be broadcast live on Sky Sport 3 on Thursday 7 December from 5.48am NZST. AC (from): 1. Enaut ZUBIKARAI (GK), 2. Liam GRAHAM, 3. Takuya IWATA, 4. Mario BILEN, 5. Angel BERLANGA (c), 6. Te Atawhai HUDSON-WIHONGI, 7. Cam HOWIESON, 8. Albert RIERA, 9. Darren WHITE, 10. Ryan DE VRIES, 11. Fabrizio TAVANO, 12. Kris BRIGHT, 13. Alfie ROGERS, 15. Dan MORGAN, 16. Daewook KIM, 17. Reid DRAKE, 19. Micah LEA'ALAFA, 20. Emiliano TADE, 21. Harry EDGE, 23. Marko DORDEVIC, 24. Conor Tracey (GK), 26. Callum McCOWATT, 30. Cameron BROWN (GK). AJ (from): 1. Ali KHASEIF (GK), 3. Salem AL EEDI, 4. Mohamed AYED, 5. Musallem FAYEZ, 6. Saif KHALFAN, 7. Ali MABKHOUT, 9. Sardor RASHIDOV, 10. Mbark BOUSSOUFA, 12. Salim RASHID, 14. Eissa MOHAMED, 15. Khalfan ALREZZI, 21. Yaqoub HOSANI, 27. Salem ABDULLA, 21. ROMARINHO, 35. Abdalla RAMADAN, 36. Khaled AL SENAANI (GK), 40. Mohamad AL ATTAS, 44. Fares JUMA, 45. Ahmed RABIA, 51. Mubarak KHALIFA, 56. Abdullrahman ALAMERI (GK), 70. Ahmed ALHASHMI, 80. Salim ALI.